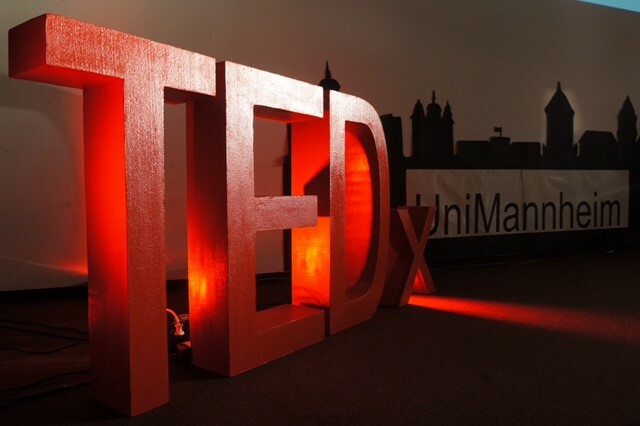 It was a long time in the making, nearly a year to be exact, but Uni Mannheim’s first ever TEDx event was a roaring success. The independently organised event bore the name ‘TED’, an organisation that is internationally renowned for being a ‘nonprofit organisation devoted to spreading ideas, usually in the form of short, powerful talks.’ TED, which has been running since 1984, has speakers who give talks on hundreds of different topics spanning the realms of science, technology, business and so much more. TEDx is based on this format, but is locally organised, taking place anywhere and everywhere, claiming to celebrate ‘locally-driven ideas and elevating them to a global stage.’ The local organisers must source the speakers on their own, and abide by the rules, protocols and format of TED. 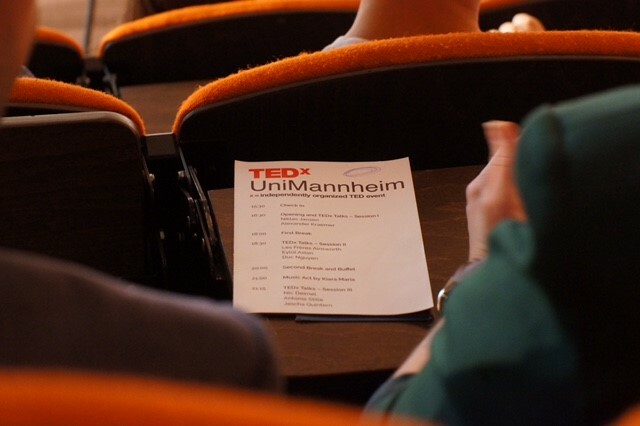 For Uni Mannheim’s first ever TEDx event we can thank a group of young, ambitious and enterprising students from Enactus and VaPassion, two initiatives at the University, who came together to apply to host such an event. 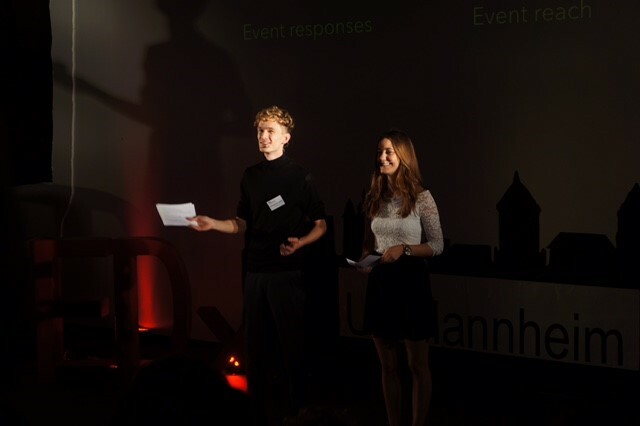 The theme of ‘passion changes everything’ was put forward by the students, an idea which clearly went down well with TED, as they were granted the license to then host what was Uni Mannheim’s debut TEDx event. Held in the Reiss-Engel-Museum, one of Mannheim’s cultural centres, the independently organised event felt professional right from the start, where on arrival the guests were asked to sign in and collect their name tag and wrist band. What was particularly interesting was the intimate feel of the event, as only 100 tickets had been allotted to the most appealing of applicants. But those that were given the amazing opportunity to attend had most certainly proved themselves, as the selection process was no simple lottery. In the application, applicants had to amongst other things answer on their ‘passion’ and imaginings of how the world could best be changed. Most incredibly, every single application was read by the student organisers – nearing on 500 applications. After an opportunity to mingle, chat with the event sponsors at their stalls, have some fun in the ‘photo booth’ with some goofy props, and fetch an alcoholic or soft beverage, the event kicked off. The charismatic Sophia and charming Christopher, our hosts for the evening, introduced the event. They explained that under ‘Passion Changes Everything’ they wanted to highlight that everything is possible, regardless of who you are. It is all about your idea and the passion you put into your work, because when you are passionate about something, you are at your best, doing what excites you. The meaning of TEDx was explored, stressing that it is really all about hearing the best ideas out there, whilst having a global conversation about a shared future. The event’s premium partners Fuchs and Rb were also introduced, the former is a lubricant manufacturing company very focussed on sustainability, the latter a firm dedicated to making ‘healthier lives’ and ‘happier homes’ who works closely with Save the Children. These companies were representing and promoting themselves at their stalls in the breaks, offering free giveaways such as hand sanitizers, foot creams, condoms (yes condoms, Durex is in the Rb group!). After a few basic house rules, the first speaker took to the stage.This was Niklas Jansen standing upon the red circular rug, the trademark symbol of TED. He is the founder of the app Blinkist, whose company slogan is ‘a smarter you in 15 minutes.’ Blinkist takes non-fiction works and cuts them down into ‘powerful, made-for-mobile units.’ He headlined his talk with ‘Passion. Purpose. People’ and focussed on the founding of Blinkist, from its roots to its growth and success. He reflected on what was crucial in the very beginning, and that was ‘burning for your idea’ through your passion for your concept. Furthermore a start-up should be absolutely sure of its ‘purpose’, and there should be a certain flexibility in how one achieves this purpose ‘you need a guiding star when launching your company.’ The last thing that is important in a start-up is the people you work with; people from different backgrounds, with different studies, and different skills. Look for people who are different from you, and better. Be the weakest in the room, not the smartest, because then you can grow and always get better. Next up on the stage was Alexander Kraemer, a ‘social business development manager’. He explained how it is possible to disprove the notion that an individual must choose profit and self-gain in business to the sacrifice of being humanitarian and helping create social change. He promoted being an ‘impact investor’ which entails balancing making a positive impact with profit, namely, there are opportunities in social challenges, and we can invest in solutions to these problems – injecting our passion and talent to help create a better world. After a break, where we had the chance to have some refreshments and chat with others about what we had listened to so far, it was back to our seats to hear from the enigmatic French brothers Jordan and Yannis Henrion. At the ripe ages of 23 and 25, the brothers had already reached success in the creative sector, with Jordan working as Creative Director at Ykone Agency (leading agency in content creation and digital influence specialising in luxury brands) and Yannis as an apprentice at L’Oreal in the digital strategy team and freelance photographer. The two together founded the LFA Studio in 2006, a platform dedicated to fashion, lifestyle and travels. They spoke about a dilemma many young people face and that is probably relevant to many of our readers at Uni Magazine, and that is the difficult choice between taking the ‘safe route,’ studying something that is a sure fire way to have a decent career later in life, or going your own way, into the unknown. The arts and creative branches are widely regarded as ‘riskier’ areas to aim at, but the brothers made it in these areas with their creativity and innate passion, explaining that you have to be a master sales person of yourself and that true passion will always set you apart. Neither of them studied arts subjects, but they made it thanks to their passion, which was the key message to take away from their talk. The next speaker was Duc Nguyen, who actually studies Business Administration at the University of Mannheim. This was inspiring because as a fellow student, it was motivating to see him up on the stage, speaking with such eloquence and passion, and many of the students amongst us in the audience were so impressed and proud. ‘Acting beyond our mindset’ was the focus of his talk, with the message that instead of giving up when we have a seemingly impossible hurdle in front of us and thinking ‘I don’t have enough money/power/voice to change anything’ (for instance in the face of crucial ecological problems), we have to remember that we are not powerless – we are the new generation, and we are key actors in driving our society forward by engaging opportunities where others see problems. Duc is the founder of the student initiative Infinity Mannheim, as well a former Youth Ambassador for ONE, an advocacy and campaigning organisation fighting against extreme poverty. He gave us anecdotes from his endeavours and projects that demonstrated that although an idea might be small, it can really make a BIG difference. The highly anticipated buffet took place shortly after Duc’s talk, and we all enjoyed some amazing culinary delights. However, another treat was in store: an incredible musical performance from Philla, a local singer/song-writer with a haunting voice and a folky vibe, who managed to hold the entire theatre captive with her honest and heartfelt music. The last three speakers, Nick Deimel, Antonia Stille and Jascha Quintern finished the night off with a bang. Nick explained to us why ‘Artists are the Ultimate Entrepreneurs.’ This is because artists are able to overcome habits; they are the creators of new content, they are ‘cultural entrepreneurs.’ The ability to create something out of nothing, and not follow the path society has given them, was reminiscent of what Yannis and Jordan Henrion had highlighted earlier in the evening. Entrepreneurs are innovators able to radically subvert, and in doing so, bring about progress and development. They cannot and will not follow the paths carved out for them, so they must use their passion, idea and vision to guide them forward. Antonia Stille, the winner of the German National Debating Competition, was another young talent to take to the stage that evening. Her talk was conducted in German, and she told us how ‘words are not everything’ when it comes to convincing others of your idea and passion. You must make a connection with your audience, whoever that may be. Do not alienate them with incomprehensible sentences and pretentious vocabulary, but establish trust with them, allow them to like you. Last but not least we heard from Jascha Quintern, founder of the start-up PulseShift GmbH as well as chairman of Hackerstolz e.V – one of Germany’s fastest growing hacking communities. Hackerstolz is all about the creative use of technology, but Jascha wasn’t there to tell us about hacking – he was there to explain ‘the league of extra-ordinaries and why you’re not part of it.’ Also held in German, he talked us through the future of artificial intelligence and computer capability, and his passion in following technological trends and digital shifts in society. He finished his talk with a very raw message: ‘you must find your mission.’ We are not purposeless, we all have a purpose. We must find what makes us passionate and allow that to lead us in life. It had been an empowering and inspirational evening, with so many speakers of such high calibre, and after thanking the speakers, sponsors, attendees and last but not least, the student organisers, everyone was able to go home a little bit wiser, a little bit more inspired and a whole lot more aware of how passion really CAN change everything. We greatly anticipate the return of a TEDx event to Uni Mannheim, fingers crossed!